Drunken Cow Cheese is now a favourite. I shared some with friends the other day, and they sung the praises of this delicious cheese. 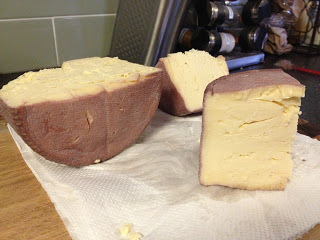 Well let me share a modified recipe from Tim Smith’s Making Artisan Cheese. His Spanish recipe titled Cabra Al Vino calls for goat’s milk and doesn’t specify what type of red wine to bathe the pressed cheese in, so let me be a little more specific. The fancy Italian name for this cheese would be Formaggio Ubriaco (Drunken Cheese). 1.5 L (1.5 quarts) Sweet Red wine (like dark Lambrusco or a darker Crimson Cabernet), enough to cover cheese after pressing. This is a washed curd cheese, which lowers final acidity. Pour milk in 10 litre stainless steel pot. Add diluted calcium chloride, stir well. Heat the cow’s milk to 32°C (90°F), and stir in diluted starter culture, cover, and ripen for 10 minutes. Maintaining the target temp of 32°C, add diluted rennet and stir for one minute. Cover and let set for one hour at target temperature. Check for a clean break. Once you have a clean break, cut curds into 1 cm (1/2″) cubes. Stir gently for one minute, then let curds rest for five minutes at target temperature. With a sterilized measuring cup, draw off one-third of the whey. Gradually add the heated water, and stir to bring the temperature of the curds up to 33°C (92°F). This will take around two and a half cups of heated water. Stir continuously to keep the curds from matting at the bottom of the pot. Once you reach the new target temp, let the curds rest for ten minutes, stirring occasionally. Drain off the whey to the level of the curds using your sterilized cup. Continue to add the 80°C (175°F) water, stirring constantly until the temperature of the curds reaches 38°C (100°F). Maintain the target temperature for fifteen minutes, stirring to prevent matting. Let the curds sit in the pot for thirty minutes at 38°C (100°F). Strain off the whey using a cheesecloth. Pour the curds back into the pot, and mill into 6 mm (1/4″) pieces. Blend in the salt. Pack the curds into a 900 gm (2 lbs) lined mould. Cover the curds with one corner of the cheese cloth, apply the follower, and press at 10 kg (20 lbs) for twenty minutes. Remove cheese from press, and gently unwrap. Turn cheese over, rewrap, and press at 10 kg (20 lbs) for twenty hours. Repeat by turning over again and press at 10 kg (20 lbs) for twelve hours. Remove cheese from the press and mould, skewer about 10 holes about halfway through the cheese on each end, then bathe the cheese in a sterilized food grade plastic container in the red wine for 24 hours. Ensure the cheese is completely covered and flip end-over-end at the 12 hour mark. Remove the cheese, lay on cheese mat (or sushi mats) for about six hours, or until it is dry to touch. Repeat the wine bath for another 24 hours, topping up with additional wine if necessary, flip again at the 12 hour mark. 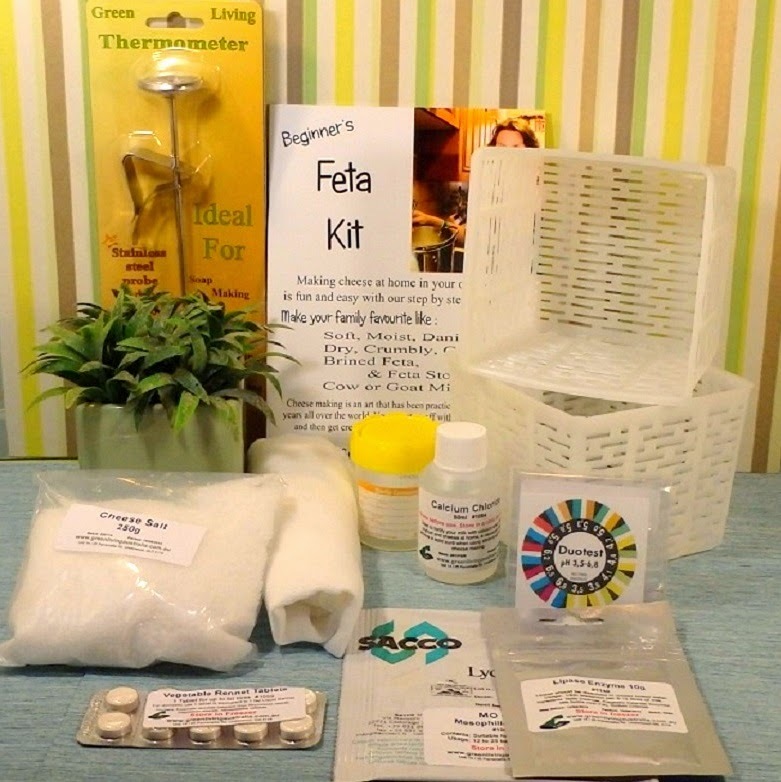 Remove, and dry on mats until touch dry. Store the cheese in your cheese fridge at 11°C (52F) and 80-85% humidity for three months. If you cannot maintain humidity, wax the cheese before it cracks. Turn cheese daily for the first two weeks, and wipe down with a brine solution if mould forms on the surface. As I mentioned in the review for this cheese, it is delicious. 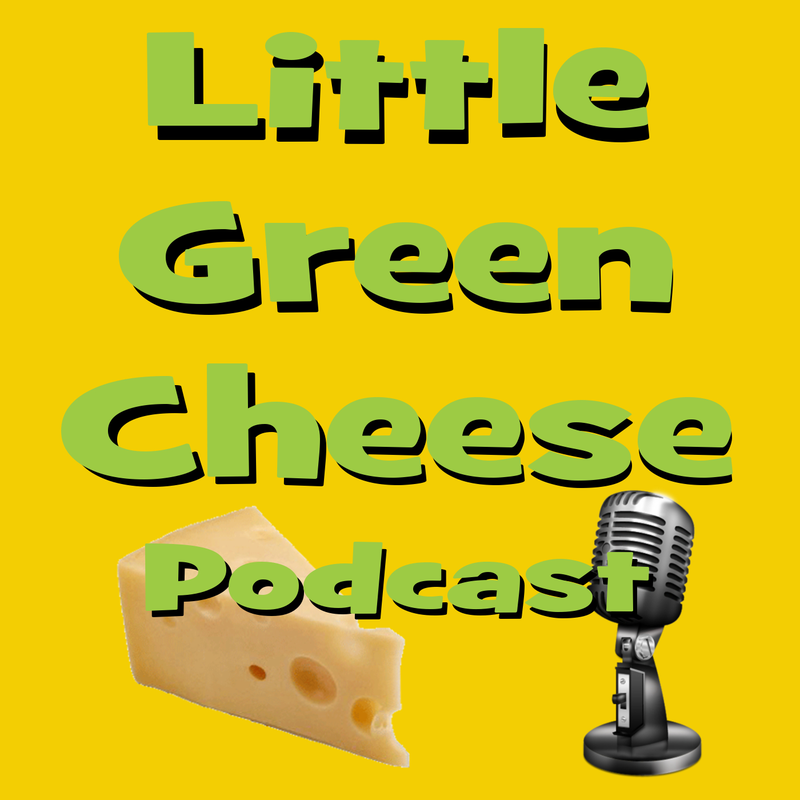 Give drunken cow cheese a try. I don’t think you will not be disappointed! The Drunken Cow cheese has matured, so it is time for a taste test. This cheese was made on the 3rd of August 2012 from 3.8% butterfat full cream milk. De-waxing: Slight swelling of the wax. There was a little moisture under the wax, with clear sweet liquid running out after the seal was broken. It was not sour. I had to dry the outside of the cheese with paper towel. 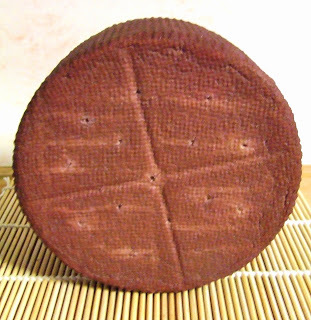 The colour of the rind had faded slightly, but still very distinct. When lightly pressed, liquid came out of the crack in the top of the round. At this stage I was a bit worried. Texture: Easy to cut, and not flaky. Very slight marbling from the wine, with clear sweet liquid within the cheese structure. Layered lines throughout the cheese. Cheese smooth and soft and very moist. Taste: I tried it by itself, and the flavour blew me away! You could smell the sweet wine on the rind, and the cheese was smooth on the palate. A bit like Gouda, but finishes in the mouth with a sweet, slightly sugary after-taste. The rind was sweeter but harder, and the centre was soft and smooth. An absolutely delightful cheese, with an exciting flavour. Unlike any other cheese I have tasted before. The washed curds technique really tempered down the final acidity and sharpness. Given the addition of 1.5 litres of sweet red wine to marinate this cheese in, it pushes the cost of this cheese up quite a bit, compared to a normal hard cheese. However, it is well worth it as it really improves the final flavour. I highly recommend the cheese for a moderately experienced home cheese maker. 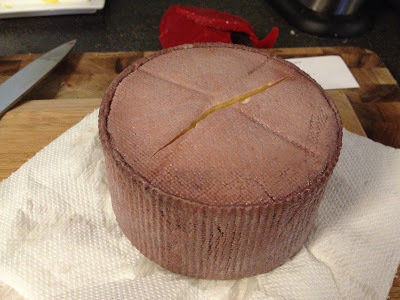 As it matures in only three months, it is a relatively quick cheese to make, and well worth the wait. This cheese will really impress your friends and family! I will publish the recipe in the next post. It has been 17 days since I made my first Drunken Cow cheese, and I have been turning it every day. Two days ago, it had shrunk so much that it cracked, top and bottom, so as this cheese has to mature for a full three months, I had no choice but to wax it. Here is the top. You will notice that the wine penetrated about 5 mm (1/4″) into the rind of the cheese, and deep into the holes that I pierced. This is the bottom. There is minimal mould build up, and it was easily washed off with a brine solution. You can see how much it has shrunk by comparing the Drunken cow, now a deep purple after being cleaned prior to waxing, to a Caerphilly that I made on Saturday night. The Drunken cow has lost about a quarter of its volume. 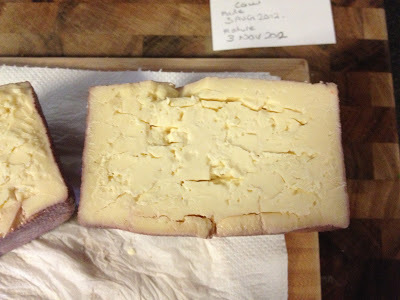 So here is the waxed cheese, all sealed and ready to continue its maturity at around 11C (51F). We will crack it open on 3rd November 2012. By the way, this cheese still smells divine. It has a deep, sweet red wine aroma. Both Kim and I cannot wait to sample it.